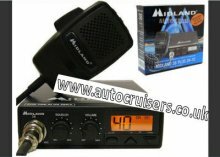 The Midland 38 has been our best selling CB radio for years and is a proven favourite with commercial and leisure users alike. The Midland 38 is simple to use, yet versatile enough to be installed on a wide range of vehicles. The Midland 38 has built in 12/24V auto switch. 80 channel CB (40 UK/40 EU). Easy to read LCD channel display. Dimensions: 123 x 38 x 165mm.